Cornelius is back for the time being. COlder weather is coming from the Polar Vortex so he may retreat to his winter home again. He is a skunk with a nightly schedule which it appears that he doesn’t deviate from. When I was at the Chicken Chat I was buying eggs at the time. In my local Stop and SHop there are a few organic brands and I bought the brand that had many good things listed on the packaging, organic, free range humanely raised. At the chat I brought the subject up, I really though what was on the package had to be true and it does to a point. but what I heard shocked me. Big co-operated farmers have a door that will let the chickens out but they don’t open the door till the hens are older therefore scared to go through the door and don’t free range. they can still say free range because the door is there, So they still live in crowed conditions. I though I was supporting an effort to promote good farming practices but in the end I was fooled. Luckily I don’t have to buy eggs anymore. This has encourage me to get to know my local farmers, it’s an easy thing to do, I know most of them from my local farmers market and now they are having local farmers a few times in the winter too. I haven’t been frequenting my co-op with bad road conditions but as soon as the weather gets warmer I will be doing that and if I have to buy eggs again I will take the trip to the co-op. 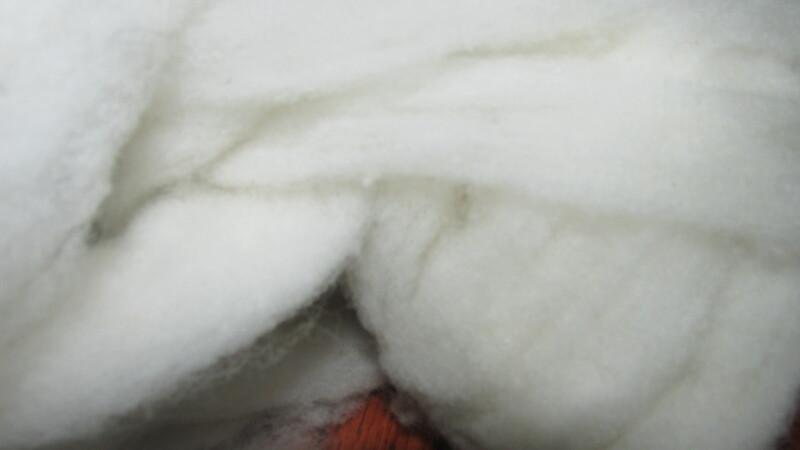 I want to make some black and white mittens soon and decided to finally spin the black roving I bought years ago at Kerry Woolen Mills and the white wool that I hand carded from my flock of Targhee sheep. 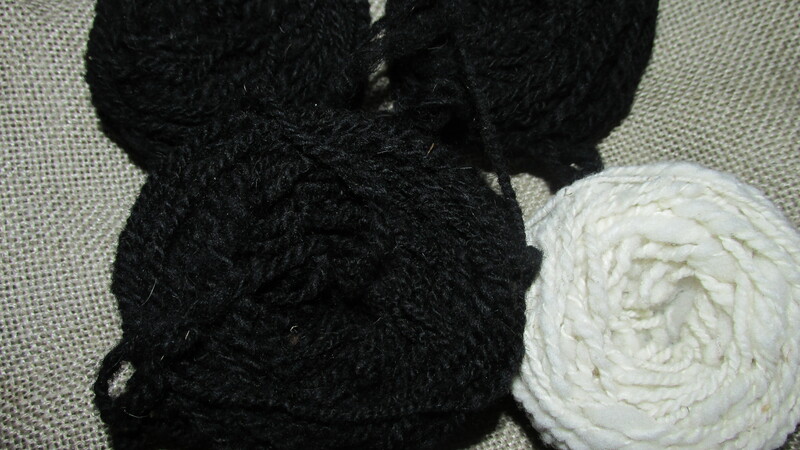 I have two things to finish before I start, one is my fleece lined mittens and the other is a scarf then onto the black and white mittens. Its gotten very cold here this afternoon, the wind is whistling down the mountain. Its suppose to increase tonight so it will be howling. Well the storm is gone and we probably did get 18 inches of snow. The trees are covered and look beautiful and the birds are out in force trying to replenish themselves. No Frozen Pipes this morning, but it is warmer. 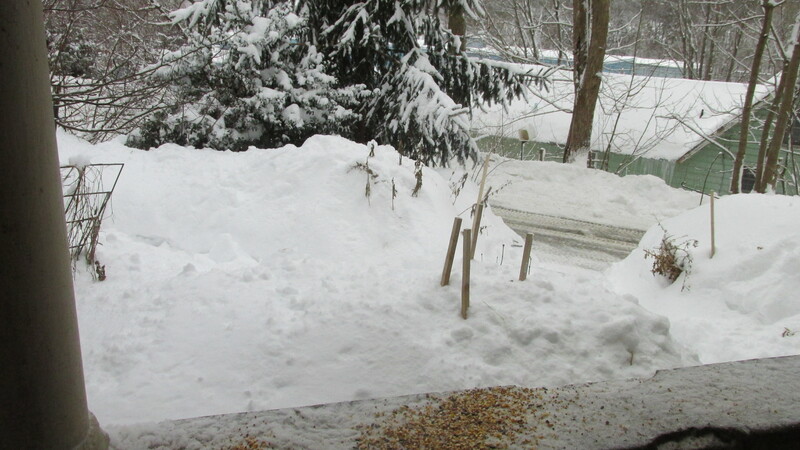 I am glad that I shoved off part of the roof last night the snow is quite heavy. The one good think about having snow is that the people who make Maple Syrup will be happy. They need a good snow pack. The sheep have all been out in it except for Marley and of course Elliott. Chris and Lilly Pad are here. She is the diva cat or I guess we should call her Princess Lilly Pad. She was found out in the streets of Framingham. 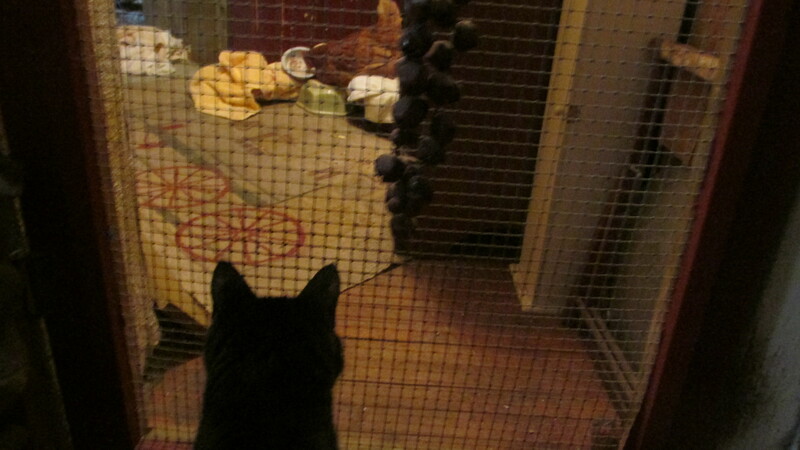 Today was the yearly Chicken Cat at Golden Oak Farm in Hatfield. The day was snowy, and conversation went from illness to feed. A wonderful film called CHICKENS OF TOMORROW was viewed by all. It’s an interesting story of how chicken breeds were changed by people. The A&P supermarket offered 10,000 dollars in the 40’s to anyone who could improve chickens so that they would produce more meat and eggs. Can you imagine that in the 40’s that was a lot of money. To make a long story short that is why today we have chickens who produce lots and lots of eggs, have more illnesses bad temperaments and don’t live long. I have one such breed The Golden Comet. They lay lots of eggs but don’t live long and can be quite nasty to their fellow hens. We think we can improve on Mother nature but she always has the last laugh. This has happened with all farm animals. Now people have seen the error of their ways and are trying to find true breeds. I listed the English version of rare breeds last week and so many breeds are critical. It was a productive day and everyone who attended went home with many new ideas. I have moved Hester into the hallway and for the first time Sammy spotted her. He just sat and sat there just wondering what she was.